Duane Swierczynski is a name I’ve come across several times before. It’s a hard one to forget, even though I probably couldn’t spell it if my life depended on it. Amazon has been quite sure that I would enjoy his work, and has recommended him many times over. Swierczynski seems to write the kind of genre fiction I find myself enjoying lately, intense crime thrillers that occasionally edge into more speculative territories. The first book I picked up by Swierczynski was his fourth, Severance Package… and I couldn’t get into it. Not sure why, it just didn’t click. I made it a few chapters in and took it back to the library. I wasn’t so sure that Amazon knew what it was talking about. Even still, every new book of his that I came across had an intriguing description. Sometimes I’m just not in the right mood to read a particular book, and I figured I might just need to give Swierczynski another shot. And what a shot it was. The kind that picks you up off your feet and tosses you across the room. Little blue birdies dancing in your vision the whole way down. I don’t know what kept me from getting into Severance Package, but there was no such hesitation when I started reading Fun and Games today over my lunch break. Within 20 pages I knew I was going to finish it this evening, and within a few short hours I’d torn through the rest in a mad rush. In my considered opinion, Duane Swierczynski has arrived, and just careened right up my list of Must Read Authors. 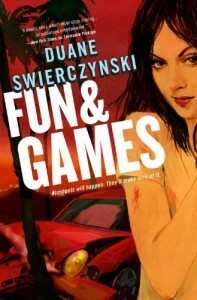 Fun and Games is the first in a trilogy, which, thankfully, will be completed promptly over the next two years (book two this winter, book three in 2012). The main character, Charlie Hardie, is a former police consultant whose life was ruined in a tragedy three years earlier. Ever since then, he’s drifted through life in an alcoholic haze, making ends meet by house-sitting for the rich and absent. He wants nothing more than to drink himself into a stupor while watching old movies and forgetting that his life ever happened. However, he gets more than he bargained for when he starts a job housesitting for a movie composer who lives in the Hollywood Hills. On his first day, Charlie is assaulted by a crazed woman who is squatting in the composer’s bathroom. The woman, Lane Madden, wallops him with a microphone stand and then starts babbling about a mysterious “them” who are trying to kill her and make it look like an accident. At first Charlie thinks she’s just a washed-up drug addict, but then he realizes that Lane is Somebody Famous, and that she may actually be telling the truth. Charlie gets all the proof he needs when “they” – sometimes referred to as “The Guild” or “The Accident People” – try to kill him. Once The Accident People make their move, Fun and Games sets off at breakneck speed and only slows down long enough to let you catch your breath before the next white-knuckle action scene. Most of the action takes place in a very short amount of time, maybe 24 or 48 hours, as the protagonists are cornered, escape, and then get cornered again. The story is full of twists and turns, misdirections and reveals, all neatly doled out with masterful pacing that kept me glued to the page. One of the great things about Fun and Games is that it’s very much a Hollywood thriller that could only be set in Hollywood. There’s a generous dose of satire layered over the proceedings; The Accident People are exactly the sort of assassins that someone would dream up for a movie, but they’re also the sort of the assassins that people who make movies might use to knock each other off. They are always concerned with the “narrative” of their kills, wanting to ensure that no hint of the true story peeks through. That Charlie Hardie will not die does not fit into their neat little storyline. It’s been a while since I’ve enjoyed a book this much, and it’s certainly been a few months since I’ve read something in one sitting. I’m definitely sold on Swierczynski now, and can’t wait to get my hands on the rest of this trilogy, not to mention his earlier books. Mulholland Books just added another one of my favorite authors to their roster.